Update: The concert doors will be closed at 18:00 and this as soon as the concert begins. Pls be there Protected content before start of the concert. 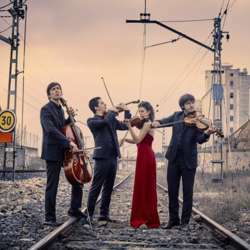 The Quartet Gerhard is one of the most promising young Spanish quartets and winner of several international awards. Despite their young age, the four musicians have traveled to the most important European festivals. This season, they are artists in residence at the Palau de la Música in Barcelona. Always faithful to the revival of Roberto Gerhard's compositions, they present the string quartet No. 1 at this concert. This is followed by a string quartet commissioned by the Centro Nacional de Difusión Musical by Tomás Marco, one of the most renowned living composers in Spain. The Quartet Gerhard concludes the evening with the wonderful lyric suite by Alban Berg and his love story hidden behind the notes. We can not sit together but after the concert we can meet. The authorisation to use the pictures and texts has been given by Instituto Cervantes.